The Five Tiger Generals is a popular appellation in Chinese culture for any five military generals serving under a ruler. 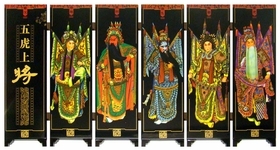 When applied to the Three Kingdoms period of Chinese history, the "Five Tiger Generals" refer to five military generals from the state of Shu Han. Records of the Three Kingdoms details the biographies of Guan Yu, Zhang Fei, Zhao Yun, Ma Chao and Huang Zhong in the same chapter. 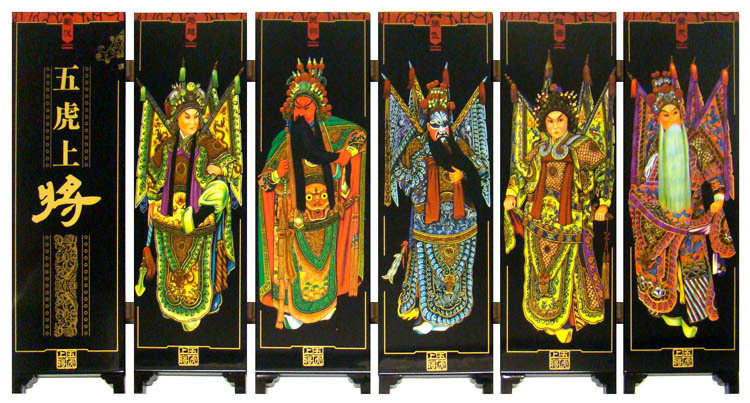 In Romance of the Three Kingdoms by Luo Guanzhong, a novel romanticizing the events of the Three Kingdoms, Liu Bei, founder of Shu Han, actually bestowed the titles of "Five Tiger Generals" on these five generals. Please note: Currently, "Chinese Folding Mini Screen - Five Tiger Generals #13" is available for shipment only in the United States. For customers outside of the US, please contact us for more information.